So excited to share these special cabins with you! A long-time member of the Rocky Mountain Elk Foundation, an organization working to preserve the land, including the vast acreage in Paradise Valley, Bonnie. 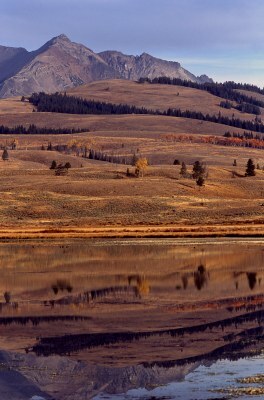 has a deep appreciation for Montana’s varied landscape, multitude of wildlife, and way of life. She enjoys the many recreational possibilities available. Bonnie is also the owner/broker of Montana Homes & Land, LLC. I have visited and hiked recently in three other beautiful national parks. 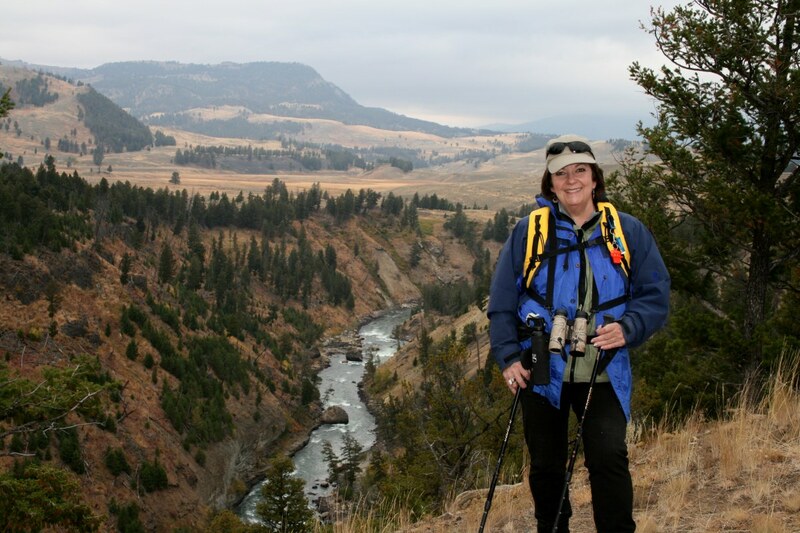 My visit to those parks further enhanced my love for the fact that Yellowstone Park combines not only viewing Nature’s exquisite sculptures but it is a wealth of experiences capturing captivating memories of cherished wildlife viewed in their natural environment and not seen elsewhere on this planet. From the North Gate of the Park, exit Yellowstone National Park at the North Gate in Gardiner, Montana. You will pass through the old stone arch commemorating the establishment of the Park. If you make a right turn, you will be in Gardiner where there is shopping and dining. You can purchase gas, food, and other items as needed. If you make a left, you are on Old Yellowstone Trail South. Follow this road out of town (pavement ends and it turns to gravel). Go about 4.5 miles. You are actually still inside the Park as the boundary wraps around Gardiner and goes north several miles. Stay on the trail through the various meadows. The river gorge will be on your right and the closest mountains on your left. 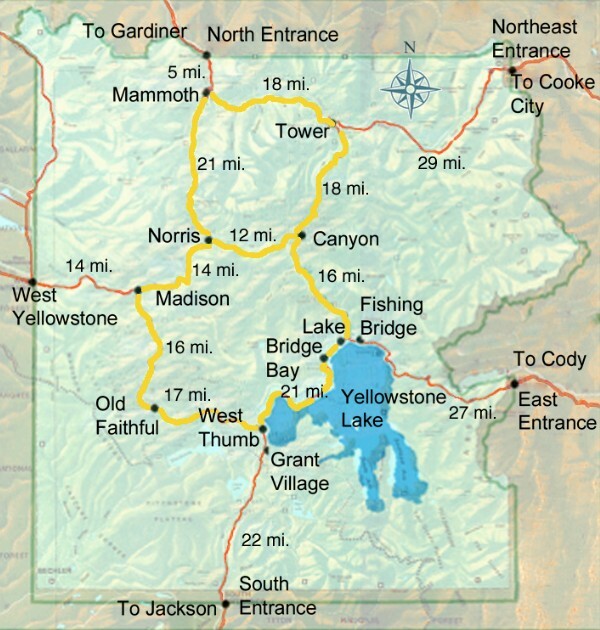 You will come to the boundary of Yellowstone Park. Proceed to the next driveway on your right (across from a black mailbox that says “Beede Resort.” Turn right into that driveway and continue beneath the log arch to your assigned cabin number. Use the individualized code entry given to you. From Billings, take the I-90 Interstate westbound. Follow the signs for Butte. You will pass towns along your way, including Laurel, Columbus, Reed Point, Big Timber. Stay on the freeway until you come to exit 333 Livingston. The stretch from Billings to Livingston will be about 110 miles. Exit the freeway at the 333 exit. The ramp brings you to the intersection of Park Street/Highway 89 in Livingston. Turn left (south) onto Hwy. 89. You will be heading south through the Paradise Valley. Go about 45 miles south on Hwy. 89. You will pass a town called Emigrant (flashing light at the only intersection with the highway). Keep going south. You will come to a sign that marks the Tom Miner Basin off to your right and then a sign that tells you you’re entering Yankee Jim Canyon (narrow canyon that the Yellowstone River runs through and where the white-water rafting tours out of Gardiner run). Keep going south. As you come out of Yankee Jim Canyon, you have another few miles to go to your turnoff. The road follows the river, which you will see on your right. You will come to a small green highway sign that says “Entering Corwin Springs.” The next driveway to the right, just a few hundred feet ahead, is your turn. It takes you to the Corwin Springs Bridge. (If you get to the Lighthouse Restaurant, you’ve gone past your turn.) Corwin Springs Bridge is the only way to get across the river until you get all the way into Gardiner. Cross the bridge and make an immediate left turn onto the gravel road (Old Yellowstone Trail South). Continue along this road approximately 2 miles. You will pass a few homes, lots of meadows, and the Royal Teton ranch operation where the buildings are painted yellow. Right after this ranch are the cabins. There is a mailbox on the roadside that says Beede Resort. Turn in under the big log entry across the road from the mailbox. Drive in and park at the appropriate cabin. Let yourself in with the combination lock code you have been given. Make a left turn onto Frontage Road (old Hwy 10). Go about 4 miles to Springhill Road. Turn left onto Springhill Road and then make a right turn in about 300 feet. This puts you on the highway that goes over the freeway. Take the eastbound on ramp (to Billings) to get on I-90. Travel about 26 miles. Take exit 333 (Livingston, Montana). Exit the freeway (ramp takes you around a cloverleaf to a traffic light at intersection of State Hwy. 89) and turn left (south) onto Hwy. 89. You will be heading south. Go about 45 miles south on 89. You will pass a town called Emigrant (flashing light at the only intersection with the highway). Keep going south. There will be a sign that marks Tom Miner Basin off to your right and then a sign that tells you you’re entering Yankee Jim Canyon (narrow canyon that the Yellowstone River runs through and where the white water rafting tours out of Gardiner run). Continue going south. After a few more miles, you will come to a small green highway sign that says “Entering Corwin Springs.” Turn at the next driveway to the right, just a few hundred feet ahead and go to the Corwin Springs Bridge. (If you get to the Lighthouse Restaurant, you’ve gone past your turn.) Corwin Springs Bridge is the only way to get across the river until you get all the way into Gardiner. Cross the bridge and make an immediate left turn onto Old Yellowstone Trail South, a gravel road. Continue along this road approximately 2½ miles. You will pass a few homes, lots of meadows, and a ranch operation (Royal Teton) where the buildings are painted yellow. Right after this ranch are the cabins. There is a mailbox on the roadside that says Beede Resort. Turn in under the big log entry across the road from the mailbox. Drive in and park at the appropriate cabin. Let yourself in with the combination lock code you have been given. Let Our Cabins Enhance Your Yellowstone Vacation!